Read on to find out everything there is to know about Password Boss. Can capture data that the user types into different web forms on the internet. The one-device-only edition comes for free and is available at all times. Can sync passwords and usernames across Android, iOS and Windows devices. The default password generator comes up with short passwords. Doesn’t handle more than single personal data entries very well. 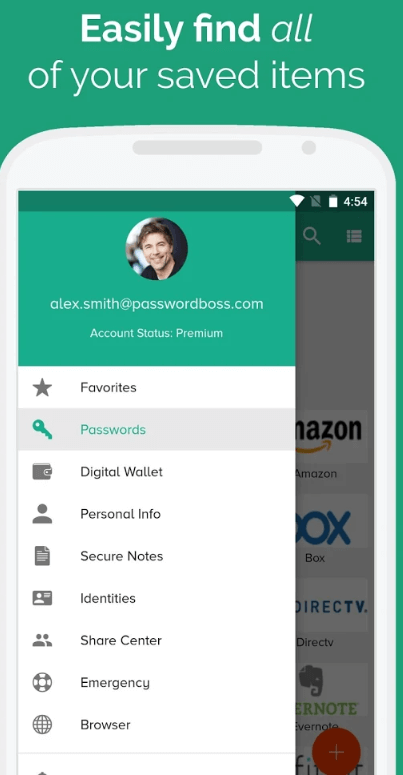 Online consumers who are looking for a full-featured and slick password manager should definitely spend some time with Password Boss Premium. It is not the most comprehensive of password managers in the market today. But it packs enough punch for it to be considered at least as an alternative to elite password managers such as 1Password and LastPass. Looking at what Password Boss has to offer, very few online consumers would correctly guess that it is a completely new entry in the field of password management products. Some of the most known men in recent times such as Johannes Kepler, Leonardo da Vinci along with Nikolai Tesla had one particular thing in common. Each of them had an eidetic memory. At least that is what is reported to us. Based on that, we shouldn’t find it hard to imagine one of them living in the modern world and not needing any kind of password managers. For us mere mortals (pretty much everyone on the planet) the act of making effort to memorize a unique and strong password for each and every website/app that we use is simply impossible without some help. We can get this help with password managers. One of those password managers that help users out to manage their passwords is Password Boss Premium. More specifically, the v2.0 of Password Boss Premium. 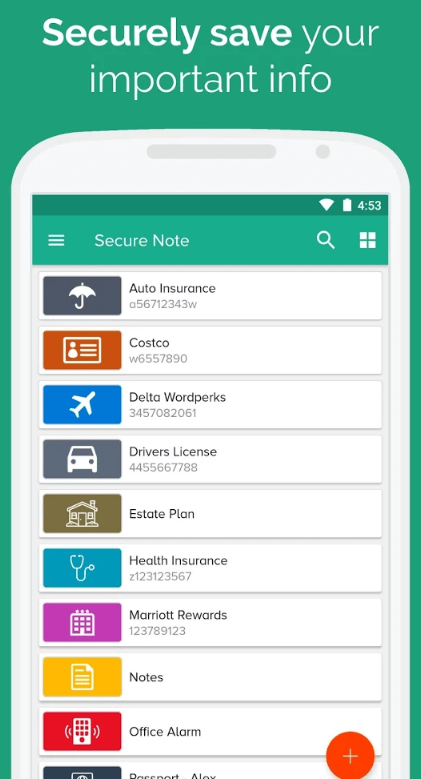 With this password manager, users have the opportunity to safely secure and store all of their passwords. This password manager also has the ability to sync all of the user’s passwords on Android, iOS and Windows devices. There is no Mac support. Of course, that can change in the future. But for now, users will have to make do with the above-mentioned three platforms. As far as functionality is concerned, Password Boss Premium comes with enough feature that allow it to provide users with everything that they would expect from a reasonable password manager. It even has some advanced password management features such as inheritance and secure password sharing facility. Pretty much like the majority of premium password managers such as Dashlane, Keeper, and others, this password manager offers users a free edition that they can use on any ONE of their internet-enabled devices. For clarity’s sake, this free edition will only work on a single device. And hence would not come with any syncing features. Users have the option of upgrading their package to the Password Boss premium edition which will cost them around $29.99 for 12 months. This price is pretty reasonable. Keeper charges users the same amount of money as Password Boss. There is also Dashlane that charges users around $39.99 each year which is a bit higher than what Password Boss charges users. Let’s not forget the Dashlane 4 password manager as well which only costs slightly under a dollar per month. Users who sign up for the Password Boss family edition pack can get four additional licenses, which takes the total licenses to five. But they will have to shell out around $69.99 per year. Dashlane has a pretty different model to Password Boss when it comes to offering free editions of their premium password managers. For example, with Dashlane, the free edition of the premium password manager comes with all of the features except for the one which allows the password manager to perform syncing actions. In other words, the only difference between the free and premium edition of the Dashlane password manager is the fact that the free edition cannot sync devices. On the other hand, Password Boss free edition is very different from Password Boss premium edition. What we mean to say is that Password Boss premium version has a lot more features for the company’s paying customers. The first “extra” feature that Password Boss premium offers is the cross-device sync ability. Fortunately enough for those online users who are curious about everything, Password Boss enables all its users to have the facility of using its premium edition without any charges for a period of 30 days. To put it in simpler terms, when the user sets up a free Password Boss account, they get to use premium features without actually paying for them for a full month. One other thing that readers should note here is that organizations such as churches, schools, and charities can actually apply for a premium edition without any cost. Perhaps this is a way that the people behind Password Boss feel they are giving back to the community. Like all the other program applications this one too sticks to the format of having one main window where it displays all user-related information. The main window also comes with a menu that is present on the left-hand side of the screen. As for the remaining part of the main window, that space is reserved for showing users their saved usernames and passwords. Users have the option of changing the way the main window displays such information. They can either make the application show the information as tiles or with the use of lists. Our research shows that the main interface of the official Password Boss program application looks awfully similar to Dashlane 4 and LastPass. Many of the choices that users have access to via the menu have the same name as Dashlane 4 and/or LastPass. If you ask Password Boss about this similarity in user interface and options text and whether the company had some connections to both of these password managers, the company’s representative would simply try to attribute the similarity to phenomenon such as convergent evolution. The first few steps are pretty obvious really. First, you download the installation file from the official website. And then you install that file on your system. That is it as far as getting Password Boss on your system is concerned. As mentioned before, there is nothing stopping free users from enjoying 30 days worth of premium features. So our recommendation is simple enough. Take advantage of Password Boss’ offer in order to really analyze if this password manager has what you need or not. Password Boss also makes it very easy for users to upgrade to the premium user. It takes very little time as well. Of course, we’re assuming here that the user actually likes the premium version trial period enough to upgrade after 30 days are over. Password Boss is pretty similar to Keeper Password Manager and Digital Vault version 10 in the sense that it too offers a startup task list. This is a list of things that the company thinks users should take care of as soon as they install their application and then try out their password manager product. The user first creating an account with Password Boss. Configuring things such as emergency access. There are lots of other things as well but we won’t mention here for the obvious reasons. Whenever a user manages to complete a specific task, the application automatically checks it with a check mark. Users do have the option of turning off this feature (the actual list). But those who don’t will continue to see the list each time they start up the Password Boss application unless and until they have checked off all the mentioned password management related tasks. Password Boss also tries to help users out with the creation of their very first Password Boss account. Well, the password manager displays a total of 15 well-known sites. Then it invites the user to save their username and password for all such sites. The other thing readers need to understand is that the page with this “popular sites” list only appears when the user has not saved any passwords using Password Boss. So it is a good idea to just click as many of these sites before actually heading out and leaving this page. The thing about this page is that once the user has closed it, it doesn’t come back on ever again. Password Boss also does a good job of keeping a backup of the user’s data via an encrypted cloud service. It doesn’t do that because it loves you. The password manager does that as a part of its data syncing process. One unusual feature that Password Boss offers to users is the choice of selecting where they want to locate their encrypted cloud data backup. The company offers a total of nine servers in terms of locations. Needless to say, there is no way for Password Boss to actually access the user data that it has stored on the encrypted cloud. It can’t do that even if the government asks it to. However, users who are slightly paranoid about the state and security of their online data should consider the location of their server a bit more carefully and choose a location in EU or close to it. We say that because the European Union has recently introduced a host of privacy laws. That makes EU way more preferable place for one’s data than the United States of America. Hopefully, there is no explanation required for why the user needs to install the official Password Boss web browser extension in order to enable the password manager’s automatically password/username capture and (subsequent) replay. If the user tries to launch a web browser that is without the official Password Boss extension then a Password Boss popup appears which offers the user to install the proper extension for that browser. As you can probably see, Password Boss has got everyone covered (almost). Whenever Password Boss detects that a user has logged to a secure site, it jumps into action and offers the user to save his/her login credentials for that site. Moreover, when Password Boss does offer to save some information, the user has the option of giving that entry any name he/she likes. Needless to say, users should try to give each of their entries a friendly name that they can easily relate to. Of course, they would have no need of remembering it. But even for searching purposes, it is vital that the user makes use of a name that makes sense to the user. Our research shows that users can also benefit from assigning new login credentials to existing folders. That is a handy tip to make organization and management much easier. The other thing users need to know is that Password Boss does not grant the user the ability to create a brand new folder at the time of password capture. Users who turn into trouble while trying to capture passwords with Password should not worry. Because Password Boss provides them with another way to capture the username and/or passwords and record other credentials. Whenever a user performs a click on the owl icon (via which they can activate Password Boss) that is present in a password or username field, Password Boss comes into action to offer either to save one’s login data and/or perform the act of creating a new password. When the user has finished submitting his/her login credentials, Password Boss saves the credentials. Then it logs the user in automatically and seamlessly. Keeper, another good password manager, pretty much employs the same technique when it comes to capturing passwords and/or usernames. However, one difference between the two in this aspect is that the user always has to click Keeper’s password manager icon. With Password Boss, whenever a user decides to revisit a website for which the user has already saved some login credentials, the password manager automatically moves in and fills all the required login credentials and then logs the user in. Our research shows that if the user tries to log out of a given website, this password manager will automatically log the user back into the site immediately. In such a situation, the only solution via which the user gets to enter another login credential for the same saved website is to first to the main program application and then make some sort of edit to the saved login credential item and then disable the feature called Autofill. After the user has managed to create a multiple number of user logins for a single given website, the user should click the Password Boss owl icon in order to bring up another menu which will show the user all the available user logins. If the user performs a click on the official web browser Password Boss extension’s toolbar button, it should bring up a rather decently sized display. This display would show the user all of his/her saved logins. Think of this display as a miniature version of Password Boss’ main application window. As mentioned before as well, users can avail the option of switching to the folder view. Users can also type in their query via the available search box. Password Boss is pretty similar to other elite password managers such as Sticky Password Premium as well as some others we can’t name here where it starts to narrow down the list for the user with matching login entries as the user is typing each letter. How is the Password Generator? The modern structure of the internet dictates that sooner or later the average online consumer would need to have a new password for a new service and/or app. For that Password Boss offers users its very own password generator. The Password Boss password generator comes in handy when the user is trying to sign up for a brand new account on a newly-discovered website and/or forum/service. It is also helpful for updating one’s existing and weak passwords. The password generator can generate new passwords which are longer and stronger to replace the user’s older weak passwords. What really pleased us about the Password Boss password generator was the fact that, by default, it managed to generate about 20-character passwords and it made use of all types of characters. That is very important in the modern world where hackers are coming up with newer and newer ways to hurt common online users. Now, the only problem with this situation is that the Password Boss password generator cannot generate passwords which are longer than 20 characters. Password Boss password manager’s maximum password length is 20. This is slightly on the low side. Especially given the fact that other password managers such as Dashlane are able to generate passwords up to 28 characters long. The Keeper password manager defaults to a 12-character long password. However, it allows the user to generate passwords that can go up to 50 characters long. LastPass can generate passwords which are over 100 characters long. We think that users who just love ridiculously long and varied user passwords (that is, passwords which are over the length of 20 characters) are a bit unusual. But the more important point is that Password Boss can’t help such users. What About the Two-Factor Authentication? Now, there is little doubt about the fact that if a group of hackers somehow managed to obtain a user’s master password, then for intents and purposes, the user is toast. These hackers will have full and unrestricted access to all of the user’s login data that the user may have stored via Password Boss. With that said, Password Boss has already made preparations to secure users against such scenarios. By offering two-factor authentication features. Users who enable the two-factor authentication feature can foil all the nasty little plans that various groups of hackers have become notorious for. Of course, everything we have said so far in this section maybe nothing but theory. But when it comes to the online world, it is always better to be safe than sorry. Regardless, with two-factor authentication feature enabled, any login requires the user (or whoever is doing the logging) to know his/her master password and something that the user has at the time of login attempt. This something is, in this case, an authentication app. Similar to a lot of other password managers and applications in general, Password Boss makes use of Google Authenticator in order to perform activities related to the two-factor authentication. Users also have the option of using Google Authenticator work-alikes like Twilio Authy and/or Duo Mobile. In order to actually use the two-factor authentication on a given account, the users will have to have a smartphone. Assuming that the user has it, he/she will need to install one of the above-mentioned authentication applications on the smartphone. Then, after Password Bosss displays a specific QR code, the user will have to snap that QR code when he/she feels ready to move forward. Now, each time the user enters his/her master password, he/she will also have to input a six-digit code. The authenticator app will generate this six-digit code. But we know that a lot of users simply get irritated by having to put two codes each and every time they want to sign in to one of their favorite services. For such users, if they like, there is the facility of changing the settings which configure Password Boss to only require the user to input the second factor only after 30 days have passed. Of course, at this stage, the user will have to specify a trusted device. Not everyone likes two-factor authentication. In fact, many simply choose to not enable two-factor authentication on their account. For such users, Password Boss provides an opportunity to add a new internet-enabled device by simply requiring them to enter a code that Password Boss sends to the user’s email account. Other password managers such as LastPass also happen to offer a broad range of options for features such as two-factor authentication. LastPass provides some really high-tech options. The highest on the tech scale is its ability (if the user chooses so) to require the user to insert a Yubikey in order to have a successful login. One of the more normal options available is for LastPass to generate a unique and printed authentication grid. Another one of LastPass’ competitor Dashlane, goes beyond offering users the utility of Yubikey. In other words, Dashlane works with any given Universal Two-Factor, of U2F, device. Intel Security also has a password manager and it is called True Key. Using True Key users have the option of enabling a multiple number of authentication methods. Moreover, users can avail these options to reset their master password. Needless to say, we have come to a point in online security where users have a large number of options available for two-factor authentication. If the user makes use of any of these options, he/she is sure to significantly increase the security of his/her online account. How does Password Boss Organize Passwords? We have already mentioned the fact that a user has the option of assigning a password to a folder that already exists right at the time when a password manager like Password Boss is capturing it. In order to create any kind of new folders, the user first has to use the previously-mentioned full Password Boss premium application. We don’t know if it helps, but users can create an unlimited number of folders with Password Boss premium. Other password managers such as RoboForm Everywhere and LastPass offer the same. There are a few other password managers that also allow users to nest folders inside other newly created folders. Additionally, users also have the facility to drag and drop different items directly into present folders. This is a feature that we would want in other password manag1ers such as Keeper as well. 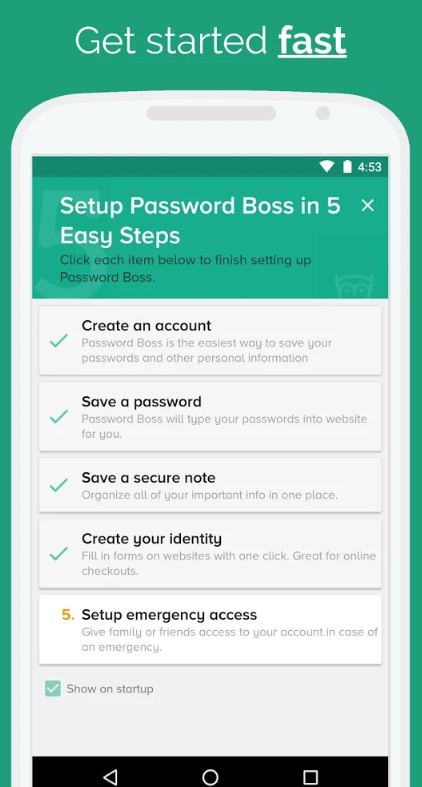 Similar to password managers such as LastPass and Dashlane, Password Boss provides users with two views of their saved passwords. The first view is the tile view. It performs the task of populating the screen with the most number of items. The second view is the list view. This view enables users to see more information (only slightly though) about each given saved user item. What about the security of passwords? Password Boss tries to take care of that as well. There is a password list right at the bottom. This is where Password Boss has placed a prominent panel. The panel displays the user’s security score. For example, if Password Boss finds that each and every password of a given user is unique and strong, it gives the user a score of 100 percent. If it detects a duplicate and/or weak password, it drags down the 100 percent score to something lower. If Password Boss considers a given password a bit too old, then it will further decrease the user’s security score. Some of our readers may wonder, what constitutes an old password? For Password Boss, an old password is a password that the user has not changed for at least three months. We would like Password Boss to at least give the user some option using which the user can adjust the definition of an old password. As the time of writing this review Password Boss had hard-coded the three months limit. For users who want to view the full and comprehensive report, Password Boss provides them with the option of clicking the panel that shows them their security score. Doing so will bring up a new list which will show the user some of his/her not-so-perfect passwords. There is also an Update option. Clicking this option displays various instructions for the user on how to go about changing a given password to a stronger and better password. This screen also offers the user with assurances that Password Boss has everything that the user needs to safely record and store the updated information. Other password managers such as LogMeOnce (is Ultimate Password Management Suite) along with LastPass and Dashlane dare to take this simple concept to another level. The above three password managers have the ability to completely automate the process of password changing for verified and specific secure sites. From a theoretical point of view, users could utilize all the three password managers to change more than a dozen of their passwords with as much regularity as they like. But since websites and services are always changing the exact procedure of changing passwords, this feature (in practice) is less useful since it malfunctions on most of the sites. Pretty much like the majority of good password managers, the Password Boss premium password manager grants users the ability to fill in financial and personal data on various online web forms. This saves the user a lot of time and aggravation of actually using hands to type out their details each and every time they want to order a product or sign up for a new website. The form-filling ability of Password Boss manifests itself in the form of three items. All of these items are available via a menu. Now, users have to concentrate here because our research shows that many will take a good amount of time before understanding how these three security items actually interact with each other. The Digital Wallet enables users to add an unlimited number of bank accounts and credit cards to Password Boss. This feature to standard credit card details, users have the option of choosing a color and also the card type of their credit card. There are different icons available which represent different cards. Choosing on will give the user’s credit card profile the appropriate logo. All of this is pretty much standard. But password managers such as Dashlane offer more details for an equivalent number of features. The Dashlane password manager not only offers users the ability to display the actual name of the cardholder but also the logo of the bank that has issued the card. Of course, we’re not saying that the information that Password Boss displays isn’t helpful. As far as the Personal Info item is concerned, it comes in a total of five types. Users have the option of adding as many items (of each type) as they want. This is pretty similar to what users can do with password managers such as RoboForm and Dashlane. Other password managers such as 1Password (from AgileBits) and LastPass grant users the ability to create one or more than one full-scale online identities. These identities contain a whole collection of user’s personal data. They can also store one or more than one user credit card entries. Users who go the route of adding very few personal and financial items, will have to fill out online web forms by filling each given entry, one at a given time. If the user clicks on the Password Boss owl icon, the Password Boss password manager extension will show the user a list. This list would contain the list of all matching data entries such as each and every single piece of phone number that the user may have stored using Password Boss official extension. However, we feel that users can have a much better online experience if they just tie together all of their individual entries by making use of one or more than one online identity. By studying the data that the user has entered during the initial installation process, Password Boss would take the liberty of creating a default online identity for the user. It provides the user with the ability to edit this online default identity. Password Boss also allows users to create new online identities. With that said, we should also inform the user that they will find navigating this Password Boss feature a bit confusing the first time around. Almost each and every item that the user stores via Password Boss comes with a hamburger icon (which leads to a menu). Users can click this icon in order to edit that specific item. There are lots of other things that the user can do via the same hamburger menu and we’ll talk more about them in a later section. For now, users need to know that the Identities feature does not offer users any such icon. Moreover, Identities saved within Password Boss do not respond to the user performing a right click on their entries. Well, it turns out, instead of performing a right click on Identities, users need to perform a simple double on them in order to edit them. Sounds obvious enough but it isn’t since other options are easily editable with a right-click action button. Let’s discuss the Identities item now. Each given Identity comes with exactly a single instance for each kind of user data. In total, there are seven kinds of user data. Five of those seven kinds fall under the personal data category. Two of those seven kinds fall under the financial data category. 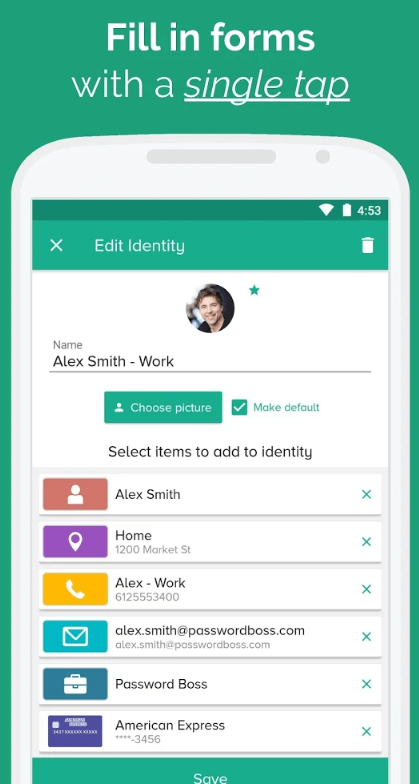 It is possible for users to connect a multiple number of identities to a single item. Let’s say the user has two identities. But both of them have the same address. It turns out, users have the option of sharing the address between the two identities. Our research shows that this feature works moderately well in practice. It can easily fill the same and single user phone number in relevant fields for fax, cell, work and home numbers. We have seen other password management products distinguishing between the same phone number for different fields. Strangely enough (and Password Boss would have its reasons) we also found out that the user must click the email address field separately in order to let Password Boss enter it on a few sites. Other users may find that when they click the given site’s email address field, Password Boss shows them the message for saving a password. Even with these minor hiccups, we feel that even if the user has to take the time to type out some of the entries present on a web form by hand, a password manager like Password Boss can still save them a lot of time and effort when entering data. Automation, whether partial or complete, is always a help (the fact that in other situations it leads to massive loss of jobs is something we will discuss later). In simpler terms, no one can dispute the fact that the sole purpose of using a password for an account in the first place is to make sure that only the user (who has set the password) is able to access a given account. This is what most people mean when they say they want security for their accounts. However, because of the changing nature of work, now people have this need of sharing accounts with other people in order to get some work done. For such people, using a password manager is even more important. Password managers such as Password Boss offer features which allow users to share their password with people they trust. 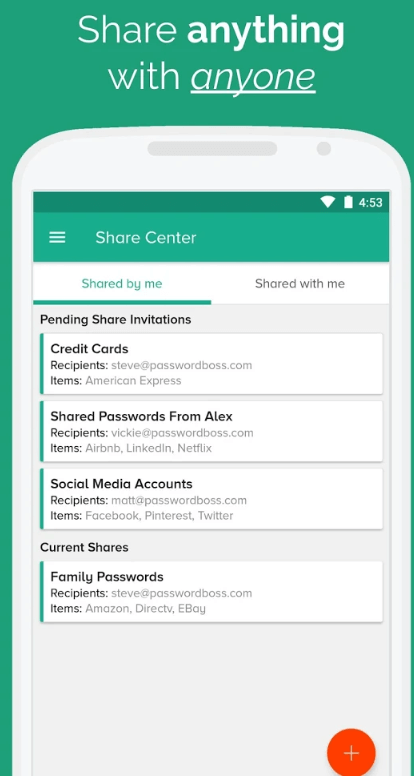 Password Boss also enables users to share other user items as well. It even allows users to share whole folders. In order to activate sharing, all that the user has to do is to select the information that he/she wants to share, and then give Password Boss the name of the person with which he/she wants to share the item. Users can add more than one recipient to the list of people they want to share the information with. Each and every recipient of the shared information has the ability to make use of the item. But only in read-only mode. Users who have shared the information also have the option of selecting if they want the recipient of the shared password to actually see the password. Password Boss users can, if they feel like it, revoke any of their shared items at any given time. They can also set a time limit on the shared item. After that amount of time has passed, the shared item will automatically expire. But as far as automatic expiry is concerned, we would like Password Boss to step it up and offer more flexibility in terms of the user setting a specific expiry time. Whenever a user shares an item with a given recipient who already has installed Password Boss on his/her system, the user gets a complete notification from within the program about the new share when it becomes available. If the recipient of the share accepts the invitation, then the sender gets another notification informing of that event. So what happens if the recipient of the share does not have Password Boss? It sends the recipient an email informing the user that to view and use the share the recipient will have to download the Password Boss free edition. This is both a good way of letting non-users become customers and facilitating communication between users and non-users. Some password managers try to cover their customers even beyond their lifespan. With Password Boss, if a user dies then all the items that the user has shared would remain open and available to all recipients. Of course, if the user has put an expiry date on the shared item then they would automatically expire after the set amount of time has passed. With that said, Password Boss doesn’t offer an option to users where they can actually transfer the ownership of their saved items to someone other than themselves. Other password managers like Keeper do offer this feature. Users of Password Boss will have to manage the inheritance part of their items including passwords and other by configuring Password Boss for one or more than one trusted friends so that they may have emergency access in the case of an unfortunate event. In order to allow full and unrestricted access to any and all of the user’s account data, the user has to, first, enter the email address of the recipient. Then the user has to write a personal message and add it to the email address. The final step is to set a specific waiting period. This waiting period can last up to 30 days. If, at any given time, the user’s trusted friend/recipient tried to request access, Password Boss will generate a notification of that request access in the user’s Password Boss user account. Of course, if the user is still alive and happy then he/she has the option of canceling the access request. The user has to do so within the limit imposed by the waiting period. If the user does not make any action and the required amount of time elapses then the recipient will get the user’s account data. In other words, the recipient will inherit it. Other password managers such as Dashlane and LastPass work in a similar fashion with similar procedures. Now, the thing users need to keep in mind here is that, Password Boss does not just hand the user’s master password to the user’s predefined recipient. Our research shows that such an action would not be possible even if the user wanted it to happen. Because only the user himself knows the master password of his/her account. Instead of doing that, when the time comes and the recipient of the email address from the user accepts the access invitation, Password Boss moves ahead to create a sort of data package. This data package lies on one of the company’s servers. Password Boss encrypts that data package with a master password that belongs to the recipient, NOT to the user. Then, when the waiting period expires, the company releases the encrypted data. Password Boss has an advanced button in place in the main application. Users can click this button in order to fine-tune options for emergency access. This may be important as the user may not want the recipient to receive each and everything associated with his/her account. Maybe the user only wants to share passwords with the recipient. And maybe the user wants to keep other items including his/her wallet to himself/herself even after he/she has left this earth. There is also an option which provides the facility of splitting up all of one’s passwords. Using this option, the user can send some of his account data to one heir and other data to another heir. Our research shows that for the majority of online users, the complete and simple account inheritance procedure is the one with the easiest steps. What about that secure web browser? The online world is filled with hackers and other cybercriminals. And the best way to not mess with them is by using a secure browser. Users who engage in other sensitive tasks should also think about doing it with the help of a secure web browser rather than a mainstream web browser. Password Boss’ web browser is based on various native Windows components. The good thing about this web browser is that it opens right inside the Password Boss main application itself. This secure web browser also makes use of a secure and safe DNS service. In this way, Password Boss protects users against the possibility of a hacker launching a DNS poisoning cyber attack. It also suppresses any and all kinds of system calls which could potentially override DNS (Domain Name System) resolution. This secure web browser can also delete cookies and all temporary files as soon as the user exits the browser. Moreover, the web browser does not allow any kind of third-party browser add-ons. Users have the option of editing any and all password records in order to indicate to Password Boss that it should always open that login credential inside its Secure Browser. In short, Safe Browser and Password Boss is a good combination. Our research shows that this combination is pretty similar to the Bitdefender Antivirus Plus pairing where the antivirus company makes use of Wallet features and Safe Pay to provide users with a secure way of engaging in financial transactions. Now, perhaps we should also mention that Safe Pay is actually a secure and separate desktop environment which is purposefully isolated from the user’s regular desktop environment. Safe Pay also comes with a hardened web browser for the user’s sensitive websites. Bitdefender’s Wallet is actually a password manager. 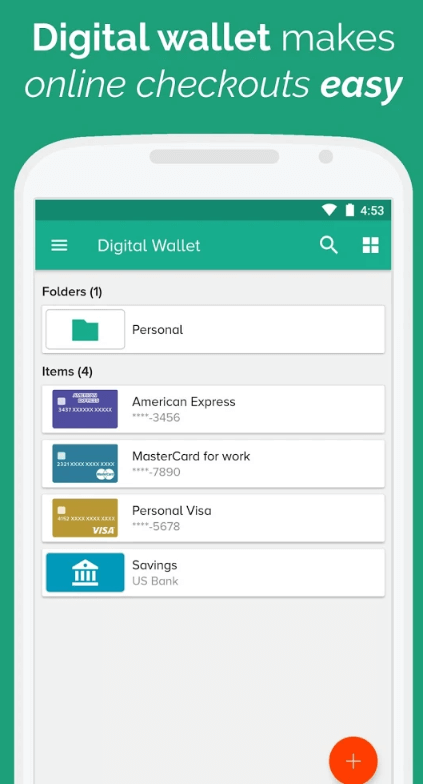 Of course, we’re not saying that Wallet can compete with the likes of Dashlane, LastPass or even Password Boss. Our thinking is that the Bitdefender Safe Pay feature provides more security against a large number of cyber attacks when compared to the secure web browser from Password Boss. However, we can’t really prove it. After the user has installed the official Password Boss application for the iOS and Android device and has logged in with his/her master password, the user will have full and complete access to all of his/her saved passwords and other items. With the iOS and Android Password Boss, users get to have all the features of Password Boss desktop edition at their feet. Moreover, there are also some bonus platform-specific options and features. To start things off, Password Boss enables users to define a PIN code (four digits long only) for easy access. It also supports Touch ID if that is available. The act of repeatedly typing out a very length master password each and every time a user wants to access Password Boss on a smartphone device isn’t pleasant. In fact it is frustrating. 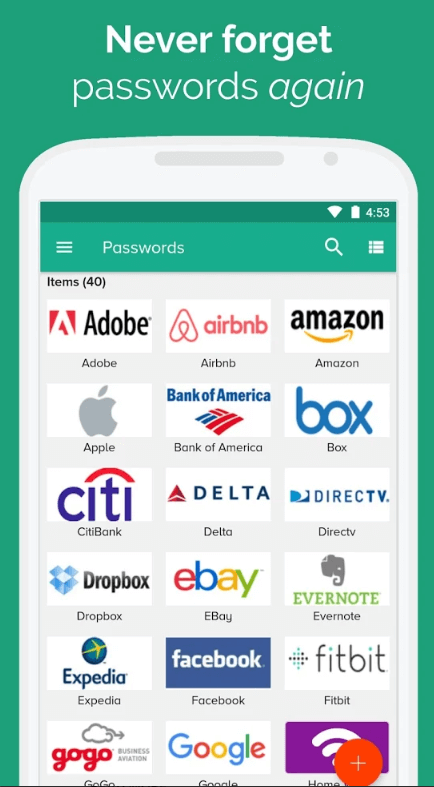 As far as the Android platform is concerned, Password Boss has the ability to handle all types of passwords for all types of apps and that too in all mainstream browsers. We couldn’t find too many differences between Password Boss and Keeper in this respect. In order to capture a new password/username and/or fill in a saved password/username, all that the user has to do is to tap the Password Boss owl icon. The other thing users should notice here is that Password Boss has all the smarts it needs to offer users relevant passwords in relevant situations. To take an example, it can easily offer the user his/her Facebook.com username/password whenever the user tries to log in to Facebook via the official Facebook app. If a user taps a shown saved password while on the iOS platform inside the Password Boss application, then the password manager automatically open up the login credential in its own proprietary web browser. This is an internal web browser and it allows Password Boss to have full control over actions such as capturing and then replaying new passwords. With that said, if a given user does not want to move away from his/her favorite web browser then that’s not a problem. They can continue to use their own preferred web browser whichever it may be. Password Boss follows the trend when it comes to the use of the new share box technology. This is a technology that many other password managers such as Keeper, Dashlane, and LastPass have also adopted on the iOS platform. Well, it is just a tiny icon which looks like a square box with a neat little arrow that sticks upwards. If the user ends up tapping that box (button) then it would turn on the official Password Boss support. Remember that when we say tap the box button we mean to tap the More button. Once the user has done that, he/she can call on Password Boss help whenever he/she is at a secure site and wants the password manager to come in and fill out existing or new login credentials. Is there an online portal? But Password Boss isn’t unique in this sense either. Other password managers such as 1Password, Roboform, LastPass and others allow users to log in to their complete password database using any of the mainstream secure web browsers. There is also Intuitive Password. This password manager works completely online. In other words, Intuitive Password does not have a local client. As far as Password Boss is concerned, it does offer users an online portal. However, it doesn’t allow users to have access to their passwords with this online portal. Users who want to check out the online portal will have to register for the Password Boss online portal separately. The online portal does not work with the master password. So in order to unlock it, the user has to first register. Once the user has logged in, he/she can utilize the interface to manage all the users on the same password management product, account details, and subscriptions. The online portal can come in handy for users who have purchased the Password Boss family back. Users also have the option of deleting a stolen or lost device from their Password Boss account here. Is Password Boss Worth it? Let’s explore that question a bit before coming to a conclusion. The v2.0 of Password Boss (the premium version) is pretty good at offering users just about each and every feature they could ever want from a password manager at this price. This puts Password Boss close to the realm of the best password managers. However, it does have some drawbacks. Firstly, there is no way for the user to access his/her passwords and sites via an online portal. Moreover, it lacks a good automatic password changing feature. It does provide users with a good mechanism for dealing with problems such as password inheritance though. Under normal circumstances, we would recommend that users should give password managers like Password Boss at least a try by taking advantage of the 30-day trial period which costs nothing after which they can upgrade if they want to do so. However, unlike a lot of other elite password managers, Password Boss does not offer a full free version. In other words, the company excludes many features of its premium version from the free version in addition to the lack of cross-device syncing. We’re not saying that users should stay away from Password Boss. But what we are saying is that they should also give some proper thought to other great password managers such as LastPass and others. LastPass is in a league of its own. Its version 4 premium edition provides users with a wealth of bonus features. One of those bonus features is the two-factor authentication feature which LastPass handles exceptionally well. Even with these features, LastPass manages to charge users way less than the industry average. There is also LogMeOnce (its Ultimate Password Management Suite) version 5.2. This password manager comes with even more features than LastPass. Our research shows that LogMeOne is perfect for those users who want all the features that a password manager could ever have. Let’s not forget other password managers such as Sticky Password Premium. This application can manage any password and not just passwords that users utilize for websites and online services. It also supports the most number of web browsers. The last option that we want to talk about here is the Dashlane password manager. It has a ton of advanced features. Even with those advanced features, Dashlane managed to offer users an easy-to-use and intuitive password manager.